I was shopping with my boyfriend’s Mum the other day and she asked me to check the ingredients of some body care products because she didn’t know what she was looking for. With half of the ingredients almost unpronounceable, it got me thinking it would be very handy to have something to take shopping that shows you which ingredients to avoid. 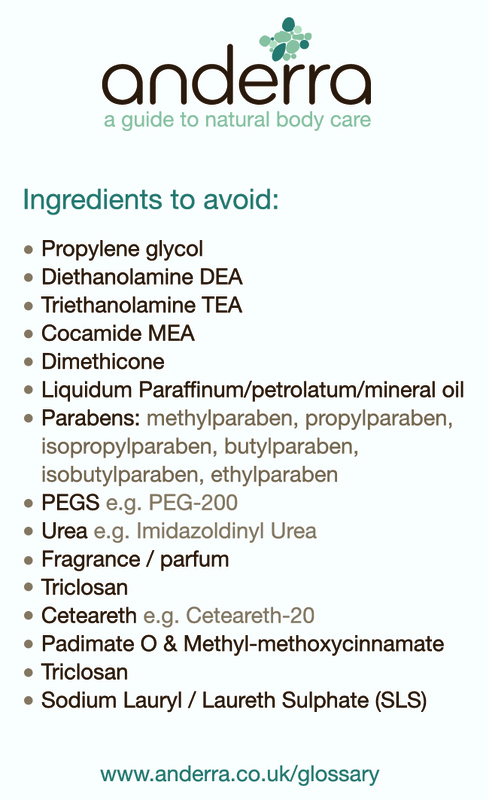 So I’ve made a handy purse card which lists ugly ingredients found in many body care products. All you need to do is print it out and pop it in your purse! Would you say that ammonium laureth sulphate is to be considered in your list as well? Some seem to think its a ‘milder’ alternative to SLS and SLES, where others think its worse!? I have seen so-call natural companies with good review and seemingly rave followers buy their natural products which contains this? Ammonium lauryl/laureth sulphate is suppose to be milder because the molecules are bigger – so do not penetrate the skin as easily…and therefore causes less skin irritation. I personally try to avoid both. Hope this helps!